I spotted this recipe on both Facebook and Pinterest. I rarely see a recipe I must make immediately, but this one I did. It doesn’t hurt I had all of the ingredients on hand, and I love it is touted as “Clean Eating.” Yeah, maybe to some, but I think limiting your portions to one or two a day is a very good idea for the waistline. And I definitely feel, anything you make yourself is better than something you had to peel the plastic off of. There are many versions of this on Pinterest, so I’m going to give you my version. I switched up a couple of the key ingredients, and I split the oats with puffed rice. I use 1/2 C maple syrup and half honey. And since anything not considered dark chocolate is too sugary, I replaced the mini-chocolate chips with Ghirardelli Bittersweet chips. 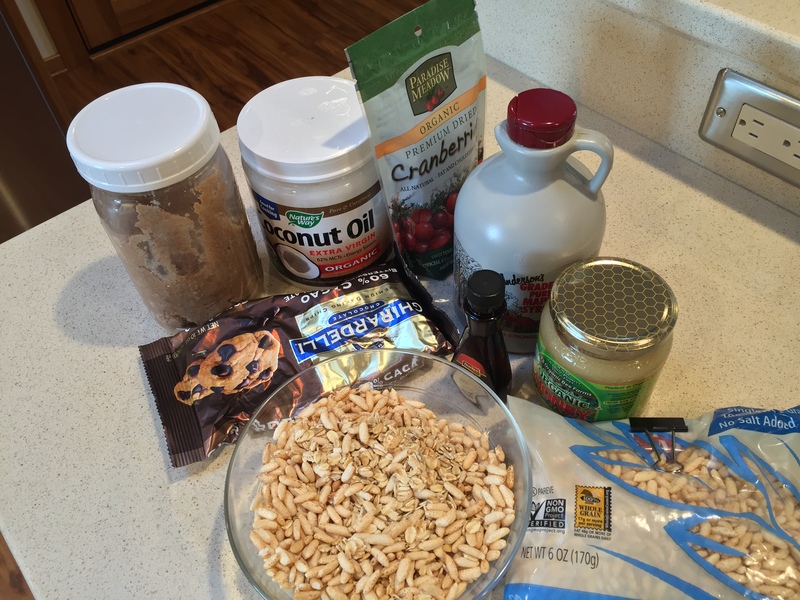 Here are all of the ingredients: Peanut butter(I make my own), coconut oil, cranberries, maple syrup, honey, puffed rice, oats, vanilla and chocolate. 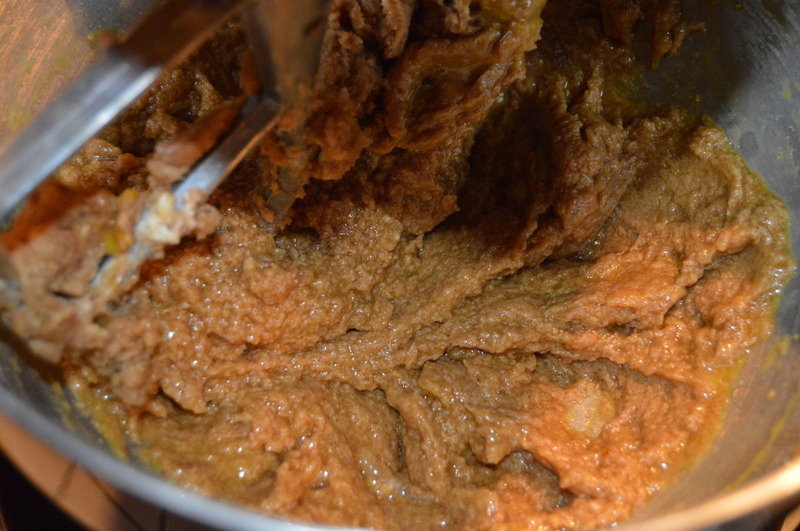 Place the honey, peanut butter, maple syrup, and coconut oil into a microwave safe bowl. Microwave for a minute or two but watch carefully. Remove from microwave and stir vigorously. This is post-microwave and a vigorous stir. Stir in the oats, puffed rice, cranberries, chocolate and vanilla. 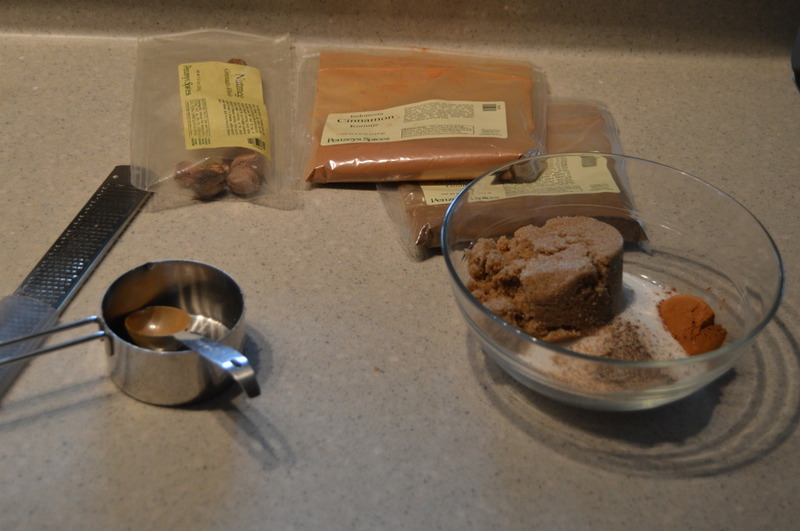 The chips should melt from the heat of the peanut butter mixture. You can either use a 13×9 or 8×8 cake pan; the 8×8 will produce Chunky like bars and the 13×9 will be thinner. Lay plastic wrap in the dish, so you can easily pull them out to cut. 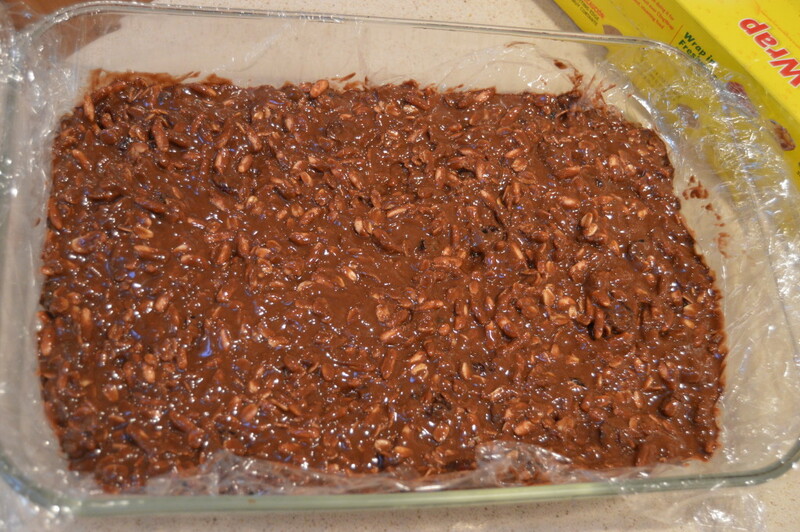 Evenly distribute the chocolate-oat mixture. 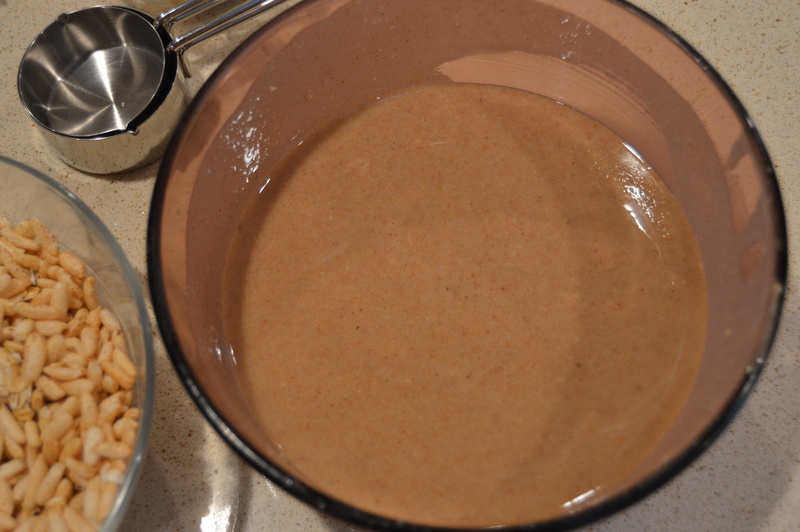 Combine the peanut butter, maple syrup, honey and coconut oil into a microwave safe bowl. Microwave on high for 1-2 minutes; monitoring very closely. Stir chunks out until smooth consistency. 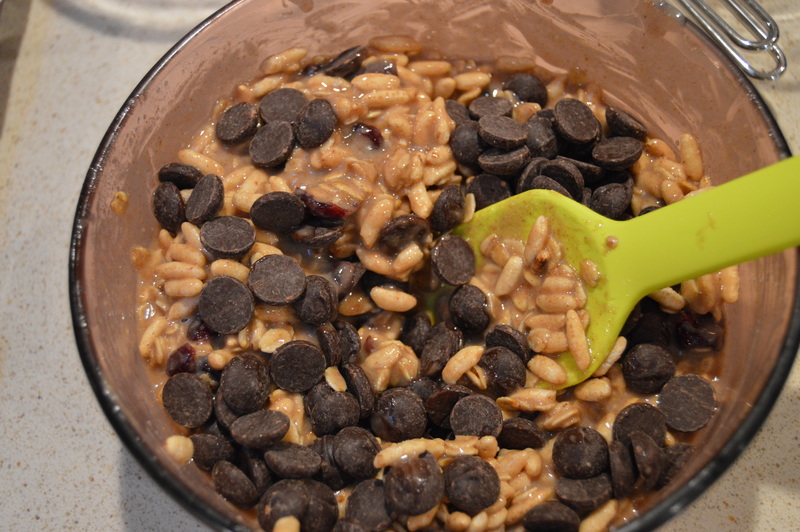 Add the oats, puffed rice, cranberries, chocolate chips and vanilla to the peanut butter mixture and stir until combined. 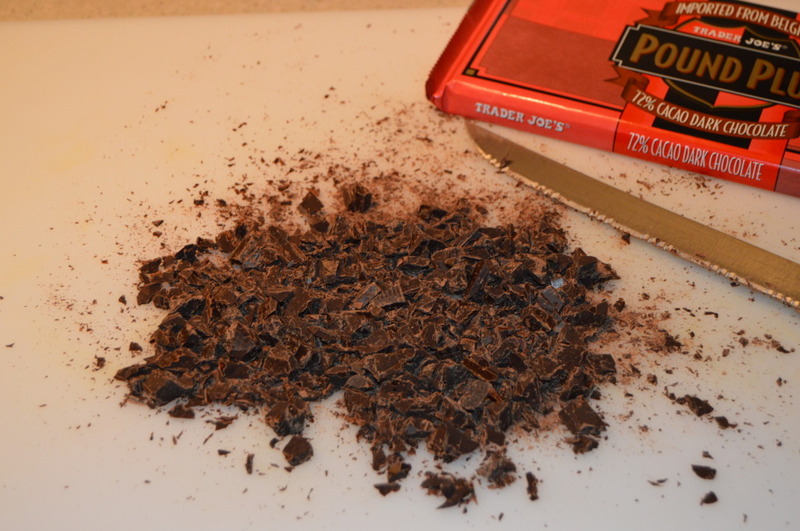 Spread evenly into a 13×9 or 8×8 pan lined with plastic wrap. Refrigerate or freeze until hardened. 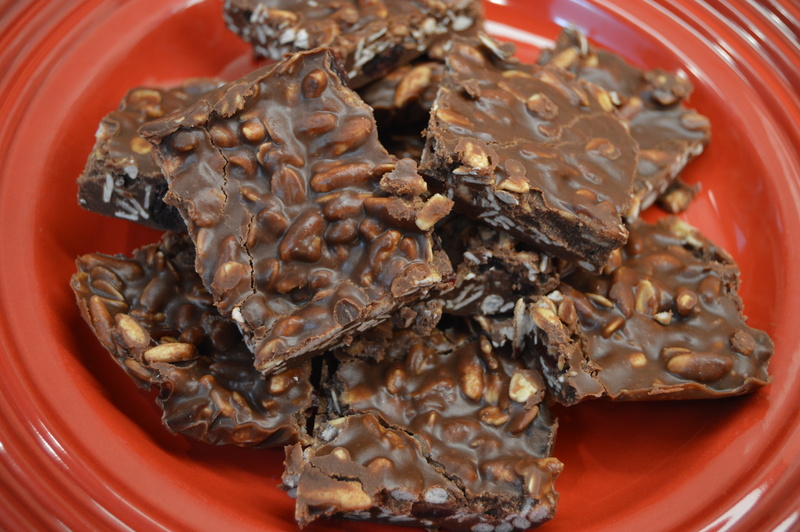 Cut into squares and enjoy this somewhat healthy snack when that sweet tooth just won’t leave you alone. This is a continuation of what I did with forty pounds of fresh, organic apples hubby and I picked a few weeks ago. He requested apple butter to be one of the results of the apple trip, and I couldn’t refuse. But honestly, I never knew this was a “thing” until I met my hubby. I am guessing his Missouri -born mom made it a time or two when he was a boy. The stuff is good, but I look at it and wonder what to do with it. The hubby uses it like a jam, but I see me pouring this over yogurt, ice cream or a bundt cake. It has a lot of spice/flavor so whatever I add it to better be boring. Once you prep the apples, this recipe definitely goes in the “easy” category. And another bonus is how good this makes the house smell for 10 hours. Here I am slicing, coring and peeling. I quarter the slices and place them and a dash of lemon juice in the slow cooker. Nutmeg, cinnamon, all spice(I didn’t have cloves), brown sugar and granulated sugar. I mixed these together and poured over the sliced apples in the crock-pot. 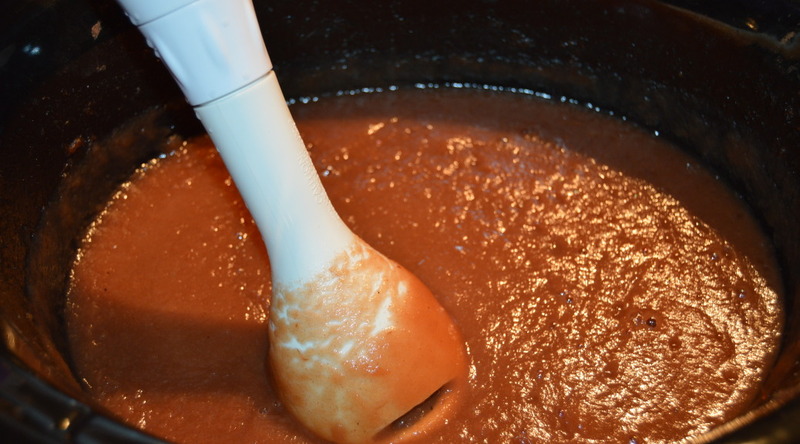 After allowing the moisture to cook-out, I took the immersion blender and turned a spicy applesauce into apple butter. 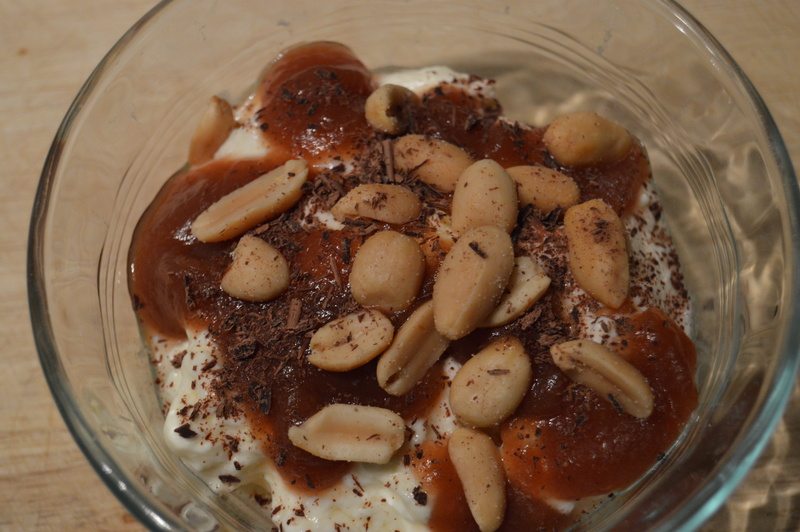 This is my homemade greek yogurt topped with apple butter, dark chocolate, and peanuts. Trust me, this stuff won’t last in my freezer very long. 2 tsp lemon juice. 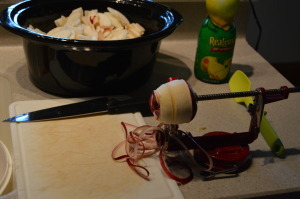 I used the lemon juice in the beginning to keep the apples from turning, so I did not add more. Fill crock-pot with prepared apples. 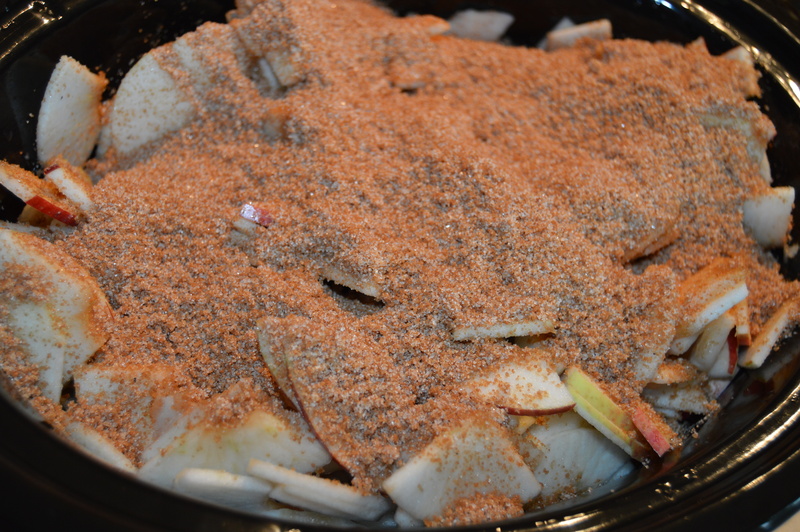 Pour sugar and spice mixture over apples. 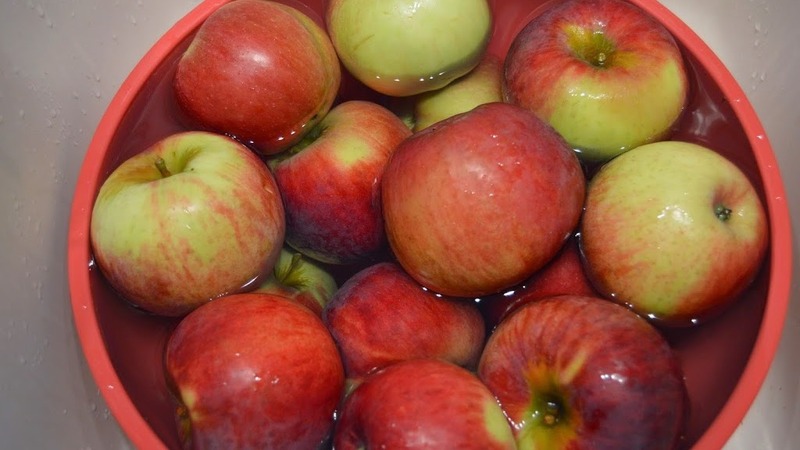 Turn crock-pot onto low and cook apples for 10 hours. After first 1-2 hours gently stir in the sugar mixture to coat the apples. After 10 hours take lid off and stir. Your mixture will be very dark and cooked down by about half the capacity of your crock-pot. Stir in lemon juice, and vanilla. At this point taste your apple butter for sweetness. I had tart firm apples and they needed more sugar, so I then added the additional 1/2 cup of granulated and 1/2 cup of packed brown sugar. You can adjust accordingly to your taste and the apples you are using. 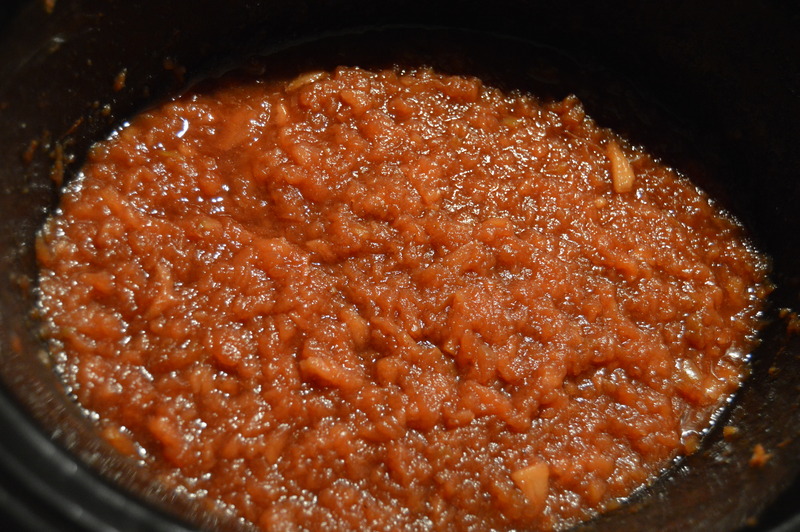 Let apple butter continue to cook for 1-2 hours with lid off to absorb more liquid and make apple butter thicken more. 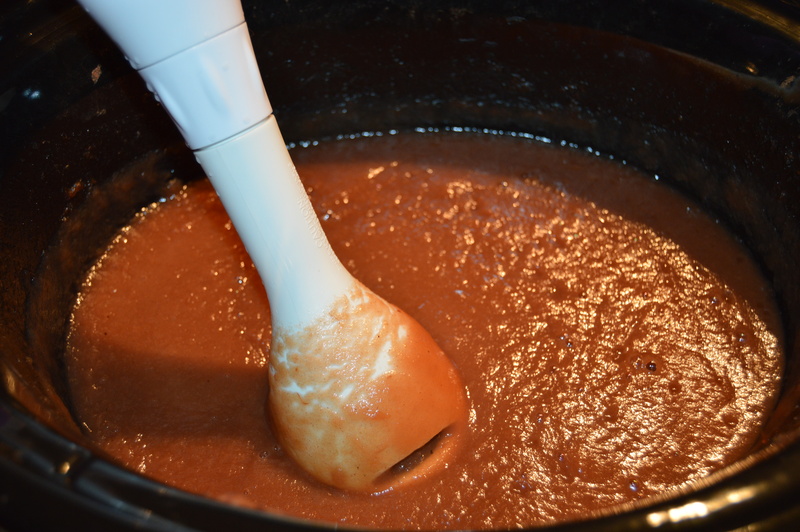 At the end of the cooking time, smooth apple butter with an emulsion blender. Spoon into clean pint jars, and cover tightly with jar lid and ring. 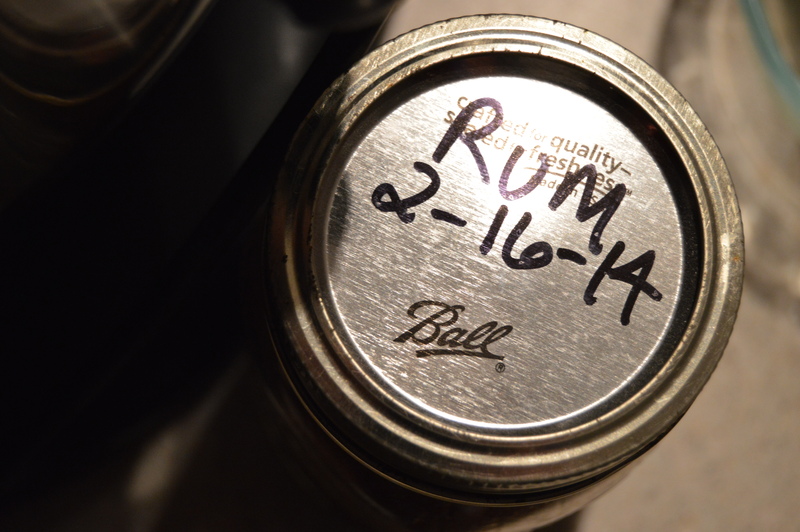 Be sure to leave room at the top of the jar if freezing. It’s Fall in the Midwest and one of our many rites of passage before winter has us in it’s grasp is to head to one of the apple orchards in the area to pick our own apples. Since I have an organic requirement, the apple orchard we went to is a little further away but the apples are well worth it. We stood at one tree and picked 20 lbs of Cortlands and then moved a few rows over to the Ida Reds and stood at one tree and picked another 20 lbs of apples. We were done and heading back home in twenty minutes. So, I have 40 lbs of apples to use up, and I am so very gleeful about this. 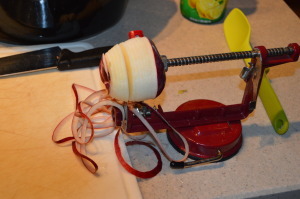 The next day I pulled my apple peeler, corer and slicer out of storage. It is an absolute must if you are working with more than a few apples. My first apple project was dehydrated apples. My daughter’s boyfriend’s father is a big dehydrating guy, and he gifted a few bags of dried apples to me in exchange for fresh eggs. I absolutely loved the flavor, so I bugged both the boyfriend and later the father for the recipe. He gave me a few, invaluable steps, and as you will see, I ran with them. I used this handy kitchen gadget to core and slice the apples. It saves a lot of time, and it also slices the apples uniformly. I poured a cup of pineapple juice with a half cup of lemon juice, and I put the apples in this liquid to both keep them from turning brown and to add sweetness. I spooned about two cups of the sliced apples into a bag with a little juice and a half teaspoon of cinnamon, and I shook until all of the apples were evenly covered. Repeat with all apples and refresh the cinnamon with each bag. Here are the apples before going into the dehydrator. I used all ten trays and set the temperature to 135 degrees for 8 hours. I didn’t want to completely dry the apples, so I kept the drying time shorter. This was the first time dehydrating apples, and I have to admit, these turned out to be quite tasty. 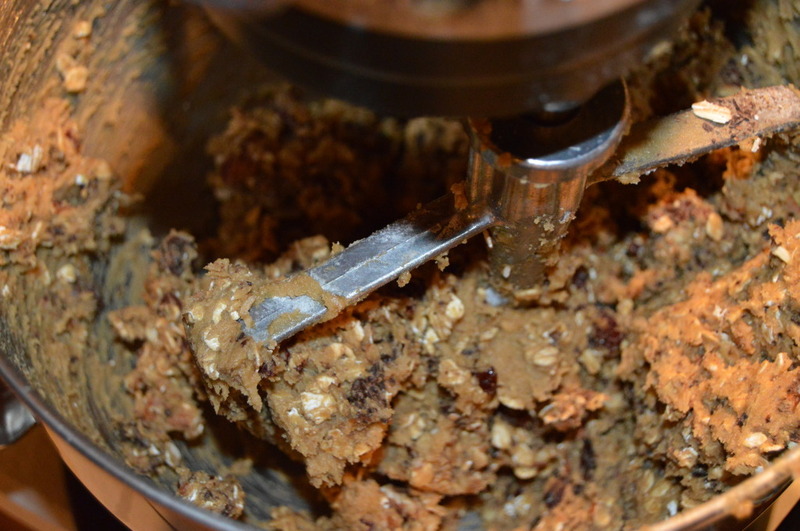 I’ve blogged about making my own granola bars in the past, but I am always scouting for easier/tastier recipes. This recipe trumps the recipe I blogged before because it calls for less dried fruit and fewer steps-winner, winner! Oh, and I love the taste and texture. This bar goes with me for long days at work or a late morning running errands(who wants to grocery shop hungry?). It fills me up, but be warned, it can get messy. The plus and yet minus in this case is homemade granola bars don’t contain “stuff” to keep the bars glued together. Trader Joe’s peanuts make great peanut butter. I put a half of a bag into the Vita Mix and I blend until it looks like butter. This makes lip smackin’ good peanut butter. 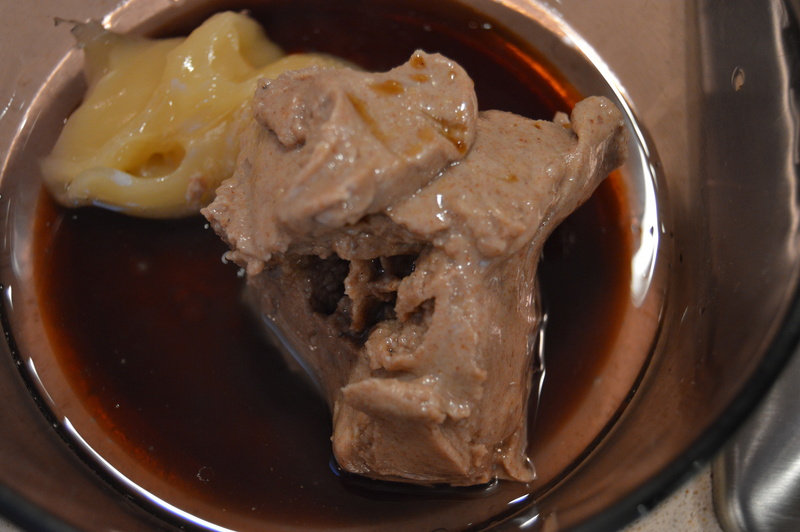 The recipe calls for a sauce pan on low heat to heat up the peanut butter and honey–pshaw–I throw it in a microsafe bowl and heat on high for a minute and then stir like a mad woman. Oh, and this isn’t honey it’s maple syrup. Chop the nuts, add the oats, puffed rice and dried fruit to a large bowl. The puffed rice adds a really good texture with very few calories. This may be what sets this bar high on my granola bar list. Add the peanut butter and honey/syrup with the dry ingredients. Stir until well combined. Add plastic, foil or parchment to the baking dish so you can just lift out and cut. Press the prepared mixture into the baking dish. I’ve made a double recipe here, so I am using a 13 x 9 dish. Put the mixture in the fridge and let harden for at least an hour. 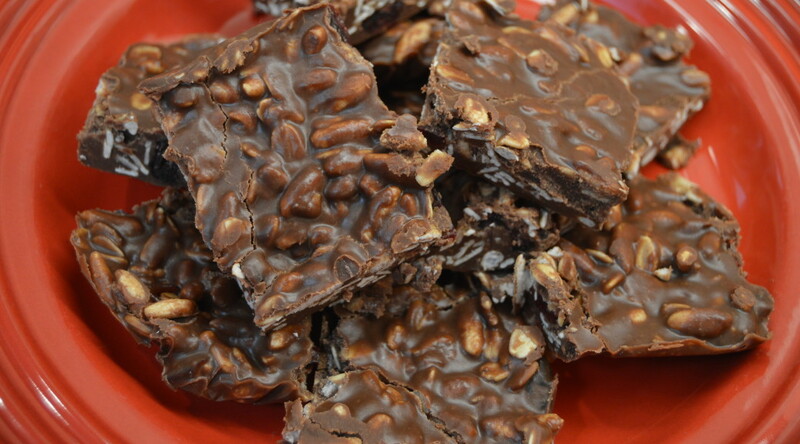 Cut into bars and wrap each bar into plastic or foil. I keep my bars in a freezer safe bag in the freezer. I transport my bar in a cloth snack bag; environmentally friendly and pretty darn cute. Try the bar with an apple–delicious. Who Can Resist Banana Bread? When I spot a few bananas getting past their prime, I instantly start carving out time to make banana bread. It’s a treat like no other. Sorry to say I’m a purist who does not put any chocolate in her banana bread; walnuts, yes, but not chocolate. 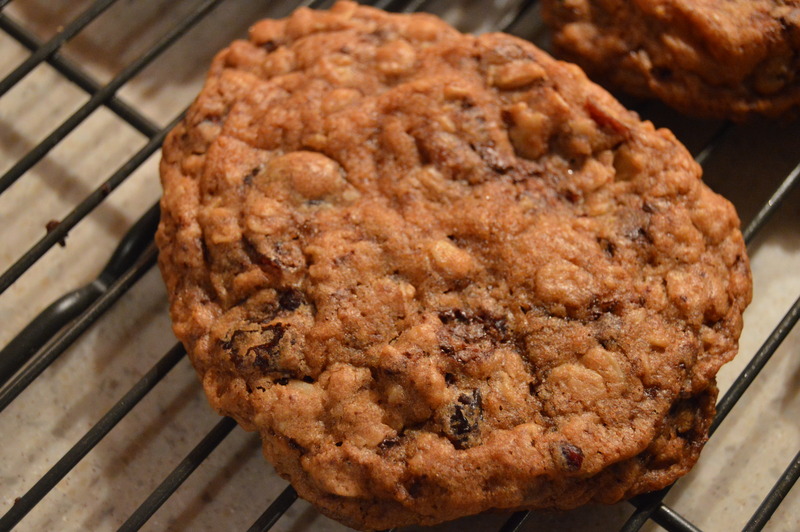 It’s one of the few baked items I make that isn’t doused in a deep vat of dark chocolate. This tasty bread doesn’t need chocolate-gulp-it’s great without it. The banana bread I’ve been making for years is from Cook’s Illustrated. It’s a great recipe and there is no reason to look for better or change it up at all. Cook’s stresses the key to great banana bread is the ripeness of the banana. 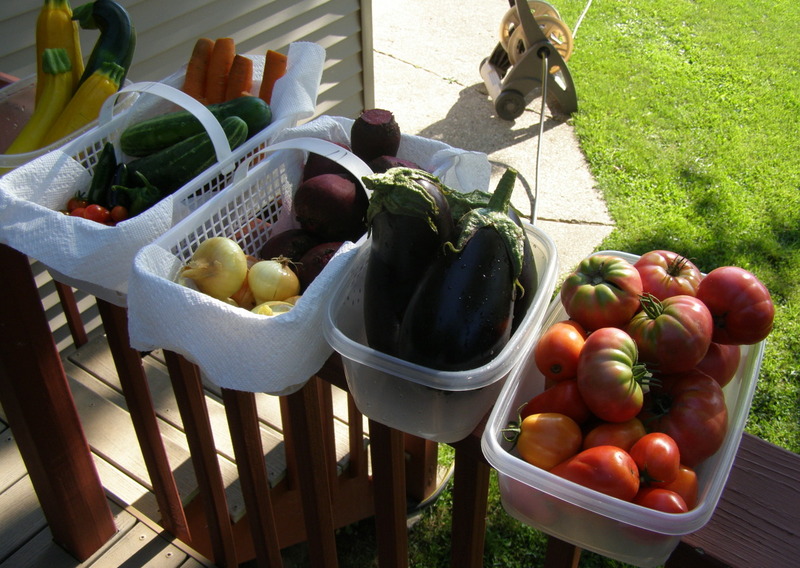 The riper the better but be sure and bag them to keep the fruit fly population in check. If you don’t have the time to bake, bag the bananas and freeze until you do have the time. First step is roasting the walnuts. Add the 1 and a 1/4 cup to a dry pan and roast on medium heat, stirring constantly until you hear popping or smell the oils. Be careful and don’t burn nuts. 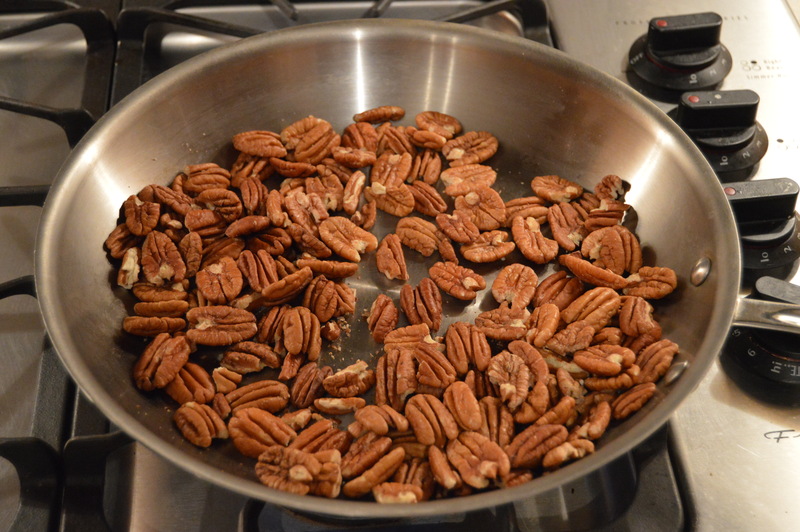 Let the nuts cool before chopping. 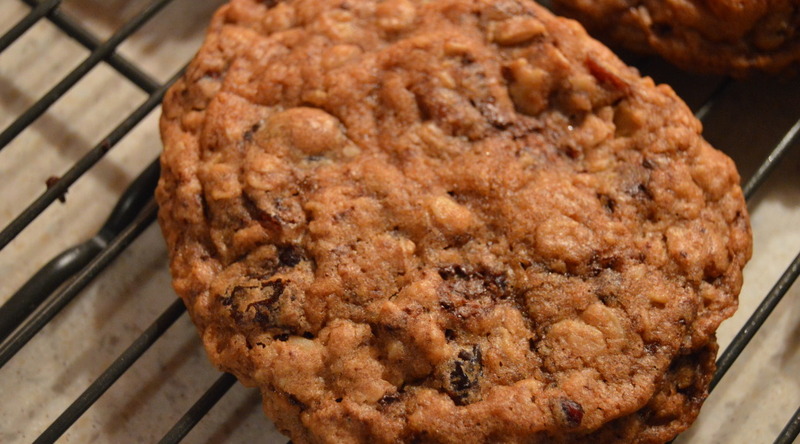 Gather your dry ingredients: sugar, flour, chopped walnuts, baking soda, and salt. Combine all into a large bowl. Gather your wet ingredients: mashed bananas, melted butter, vanilla, eggs, and yogurt. Combine wet ingredients in a medium bowl and then add to dry. Stir gently until combined and add to prepared bread pan(greased and floured). Bake for an hour or so until a long toothpick(or I use a spaghetti pasta)comes out clean. Nom, nom, nom. I ate the heel seconds after taking the photo. 1. Adjust oven rack to lower middle position and heat oven to 350 degrees. Grease bottom only of regular loaf pan, or grease and flour bottom and sides of nonstick 9-by-5-by-3-inch loaf pan; set aside. Combine first five ingredients together in large bowl; set aside. 2. Mix mashed bananas, yogurt, eggs, butter, and vanilla with wooden spoon in medium bowl. Lightly fold banana mixture into dry ingredients with rubber spatula until just combined and batter looks thick and chunky. Scrape batter into prepared loaf pan; bake until loaf is golden brown and toothpick inserted in center comes out clean, about 55 minutes. Cool in pan for 5 minutes, then transfer to wire rack. Serve warm or at room temperature. Two cups sliced, roasted(or boiled) beets and two cups sweetened apple sauce. Process for a minute until well blended. Voila’ you have just made your own fruit roll/leather. Be impressed…this is pretty darn cool. Notice the missing leather in the bottom, right-hand corner; hard to resist. Best if kept in refrigerator but will last 3-5 days outside of. It’s what I offer to bring when I don’t want to worry if there will be any vegetarian offerings. And, may I add, a lack of vegetarian options happens quite often here in WI. I often take the chance of my healthy but delicious hummus having only but one or two spoonfuls taken out while the sour cream with bacon dip dish is licked clean. Oh well, so is the life of a vegetarian stuck in the land of brats. I may take a large amount of my hummus back home, but the other guests have no idea what they missed. I make a spicy black bean hummus that tastes so good with a good quality tortilla chip, but it looks a little nasty. Or my favorite is black eyed pea hummus that is so creamy and rich, I eat it by the spoonfuls. One of the many reasons I love hummus is because of it’s versatility: add any legume with tahini and you have a different hummus. Why does my hummus taste so much better(yes, this is subjective) than the store-bought or your nearest deli? Well, I am about to disclose my hummus making secrets to you. So if you are a veg-head like me, or you are watching the calories you consume even at a party, follow my lead. Surround the hummus with quality pita chips, chunks of pita bread, or vegetables, and you have yourself a delicious mini-meal in case your healthy or vegetarian/vegan options aren’t looking too promising. I make hummus from organic dried beans(1 cup dry equals 2 1/2 Cups cooked). It’s cost effective, and I control the sodium. Save yourself some time and soak the beans overnight or for eight hours. I soak them in filtered water in a large mixing bowl(don’t forget the beans expand) and the picture above are the beans post-soak. For convenience or time constraints, use canned but remember to rinse well. This is where the pressure cooker comes in handy. Chickpeas that would normally take an hour to hour and a half simmering on the stove-top, get done in fourteen minutes with a pressure cooker. Once you do a natural release, strain the beans, but be sure to save a cup of the cooking liquid. Set aside beans and liquid to cool. Okay, you can’t use my pictures as a guide–I made a double recipe of hummus. I always freeze the other recipe just in case I need hummus in a pinch. Pull out the food processor and chop a clove of garlic. Add the rest of the ingredients: 2.5 Cups chickpeas, 4 ozs roasted red peppers, 1.5 Tbls Tahini(ground sesame seeds), three Tbls lemon juice, 1 clove of garlic, 1/2 tsp ground cumin, 1/2 tsp cayenne pepper, 1/4 tsp salt. Process for a minute, and here is where my secret comes in, slowly add a Tbls or two or three of the cooking liquid. Process until desired consistency and move the hummus to the fridge. While the hummus is chillin, work on the pita chips. Buy a pack of good pita bread; this is whole wheat pita. Cut into eighths and separate the thin and thicker sides of the bread. Spray a lined cookie sheet with olive oil and sprinkle with salt. Lay the bread down in a single layer and spray and salt the top. Add a few twists of ground pepper here. Bake at 400 F for 6-8 minutes. Watch them closely–they burn fast. 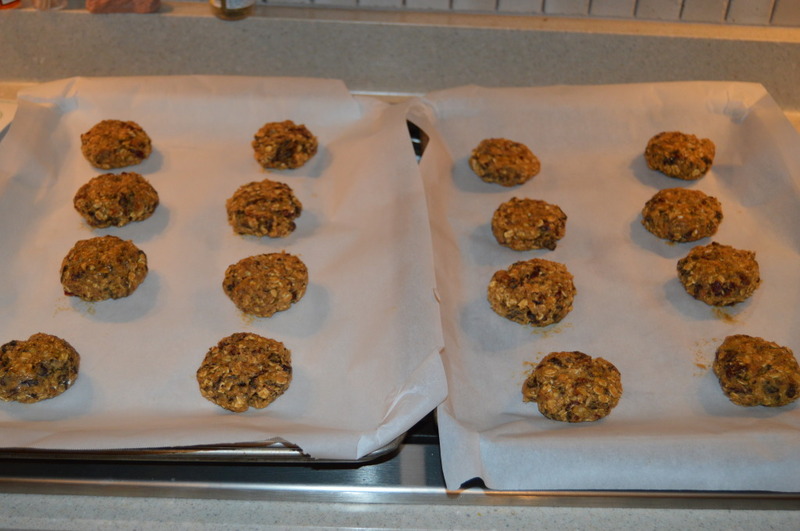 Leave them on the cookie sheets until cool and crisp. Bake the thin sides first and the thicker in the next batch. The thicker sides will need a minute more. 1.Add the soaked chickpeas to the pressure cooker with 8-10 Cups of water. Pressure cook for 12-14 minutes with a natural release. 2. Cut each pita bread into 8 triangles. Place triangles on lined cookie sheet. 3.Spray pan and sprinkle with salt. Add bread to the pan and spray with olive oil. Sprinkle more salt and pepper on top. 4. Bake in the preheated oven for about 7 minutes, or until lightly browned and crispy. Watch carefully, as they tend to burn easily! A pathetic looking perennial growing underneath our dryer vent(a duh moment when we planted it years and years ago), and now accessible to vacuums with feathers, it looks even worse than previous years. Rhubarb grows like a weed here in WI, and it is for this very reason, I refuse to pay for it. Someone must have some stalks they would be grateful to part with. t Within three days, my father-in-law dropped off trimmed, gorgeous stalks of rhubarb weighing in around 5 lbs. I couldn’t thank him enough. Rhubarb is certainly a sign spring has sprung. It was green and growing while there was still snow on the ground, so it’s a very tough plant. It’s used like a fruit in pies and cobblers, but interestingly, it’s a vegetable. I can honestly say it’s the only vegetable I add sugar to; one cup sugar for every 1.5 lbs of diced rhubarb(adjust the sugar if a sweet fruit is added). It reminds me of a cross between celery, because of the strands, and cranberries, due to the tartness and needing sugar. So if you are lucky enough, and a neighbor bestows you with a bunch of rhubarb, strip the stalks of their poisonous leaves, and cook or bake it into something delicious! The simplicity of this “vegetable” is perfect for busy spring. Dicing the 5 lbs of rhubarb. Yes, I’ll be freezing some of the compote. Diced stalks with sprinkled sugar. I used cane sugar so it’s a little brown. Some of my fresh yogurt, rhubarb compote, and dark chocolate. I am seeing adding this to waffles, pancakes, biscuits, and sponge cake. -1.5 to 1.75 lbs of rhubarb, cleaned and diced to 3/4 inch pieces(about six cups). Trim ends of stalks and cut into 3/4 inch pieces. Peel away any tough skins. Stir together rhubarb and sugar in a large saucepan (off heat); let stand until rhubarb releases some liquid, about 10-20 minutes. Travel is tough for a healthy foodie like myself. I can usually find something I’ll eat in the airport, but once I’m on the plane, not so much. The latest airline we booked with didn’t even ask if there were any diet restrictions. This doesn’t bode well for this sworn health-nut, veg-head. To prepare for my, “turn the nose up and give the tray back to the airline attendant,” I’m going to bring TSA friendly snacks on board with me. No, I am not buying those over-priced, fructose laden snacks they have on the concourse;rather, I’m making myself some healthy snacks. So if I get hungry on the first leg of our flight(8.5 hours), I’ll be ready with healthy alternatives. I have been thinking and planning these snacks since I purchased tickets last summer from a cut-rate airline. I’ll have my bagged snacks, a couple of bananas, and a large bottle of water. With my Kindle Fire in one hand and ear plugs jammed into my ears, I’m ready for a smooth flight across the Atlantic. From left to right: Dehydrated Chickpeas, Deviled Chex Mix, No-Bake Peanut Butter Granola Bars, and No-Bake Energy Balls. I did a search for various directions and recipes, and I came up with my own concoction. I re-hydrated chickpeas in the pressure cooker, and while they were still warm, I sprinkled with apple cider vinegar, sea salt, and cracked pepper. I then dried them in the dehydrator for 12-14 hours. This will be the protein I am sorely lacking with my snacks. I pulled this recipe off of one of the Chex boxes. Interestingly enough, when I checked this recipe on the Betty Crocker website, they upped the oil from three tablespoons to a 1/3 of a cup(whaaat?). I’m sticking with the three tablespoons. 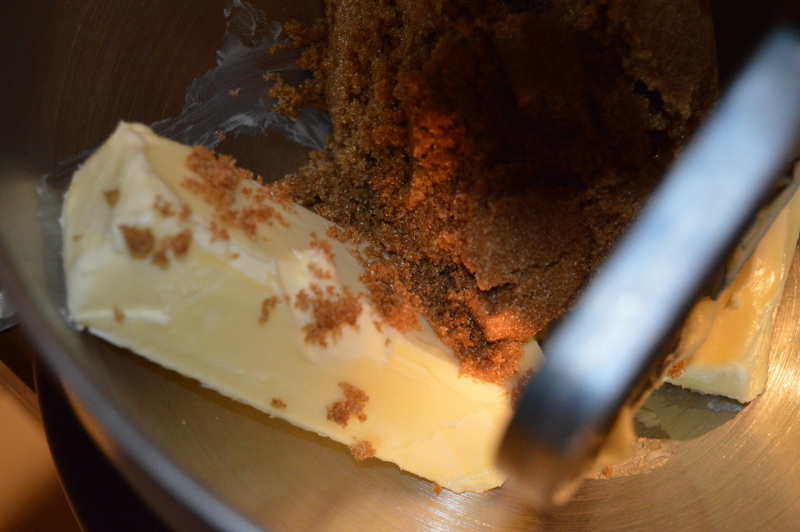 I reduced the sugar down to one tablespoon to keep the mess at a minimum. 1In small bowl, mix sugar, paprika, chili powder, curry powder, cumin, coriander, pepper and salt; set aside. 2In large microwavable bowl, combine oil and nuts. Microwave uncovered on High about 2 minutes or until fragrant. Stir in cereals, crackers and pretzels until evenly coated. Stir in sugar mixture until evenly coated. 3Microwave uncovered on High 2 to 3 minutes, stirring every minute, until mixture is thoroughly heated. Spread on paper towels to cool. Store in airtight container. I pulled these off of another blog, http://minimalistbaker.com/healthy-5-ingredient-granola-bars/ I traded out the honey for maple syrup, and I shall never eat another store bought granola bar again. I had to work in peanut butter since I probably won’t see it for awhile. Europeans love their Nutella, and the hubby and I learned that the hard way in Barcelona. We were suffering from jet lag, when we woke-up with hunger pains at 1:00 am. We ventured downstairs to the hotel clerk who looked at us like we were…crazy. We asked him for a place to get food, and he informed us, “Just drinks at this hour.” Hubby and I were not about to give-up. We walked up and down a few streets until we happened upon a convenience store, of sorts. We collected a loaf of bread, bananas, nuts and Nutella? No, we scoured that place in search of peanut butter and none could be found. We ate Nutella instead, and it’s not remotely the same. 3. Place oats, almonds and dates in a bowl – set aside. 6. Press down until uniformly flattened. Cover with parchment or plastic wrap, and let set in fridge or freezer for 15-20 minutes to harden. extra fresh, but it isn’t necessary. I pulled these off of Facebook a year ago or more. Easy to whip-up and great to pop a few before your workout. InstructionsMix all together is large bowl. Let chill 1/2 hr in fridge. Then make into 1 inch. balls. There they are, snacks that are relatively mess free, figure friendly and health friendly. And all four are easy and take very little time(use canned chickpeas for even less hassle). What doesn’t gets eaten on the plane will be handy for snacks in our hotel rooms.